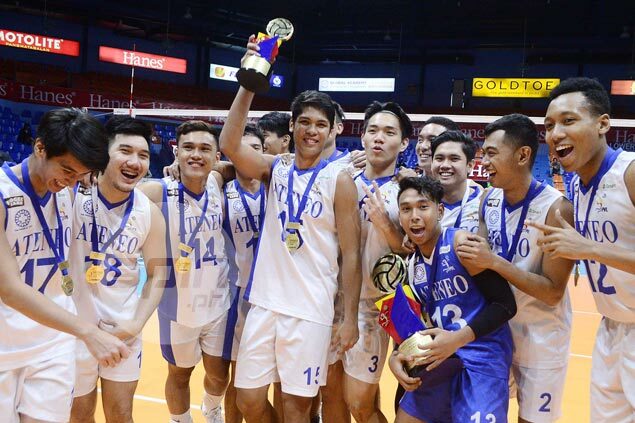 ATENEO star Marck Espejo became the first Most Valuable Player of the Premier Volleyball League, getting the top individual award in the Collegiate Conference men's division. The King Eagle was named MVP of the Conference and hailed Finals MVP after leading Ateneo to its third straight title, including the last two Spikers’ Turf tournaments. Ateneo claimed the conference title with a finals sweep of Far Eastern University. Espejo was also the first best outside spiker. He averaged a tournament-best 18.14 points per game during the elimination round and registered 62.86 percent success rate in attacks and 0.45 service winners per frame. But Espejo was not all score as he also tallied 1.95 digs per set and 56.12% efficiency rate in reception. Ateneo libero Manuel Sumanguid was named best libero after averaging 2.68 digs per set and posting 60 percent efficiency rate in reception, while Eagles setter Ish Polvorosa was the best setter after averaging 10 excellent sets per frame. Head coach Oliver Almadro, meanwhile, completed a grand slam, bagging the Collegiate Conference title after steering Cignal to the Reinforced and Open Conference championships. Fauzi Ismail of National University was named second best outside spiker, while teammate Kim Malabunga was the second best middle blocker. John Paul Bugaoan of FEU was the first best middle blocker, while Joshua Umandal from University of Santo Tomas was named best opposite spiker.